Now it's easier than ever to book the biggest names in entertainment to appear at your San Diego party or event, whether you're planning a corporate party or a fundraiser. Whether your event is at the House of Blues or Sea World, the success of your event could very well depend on the entertainment you provide. 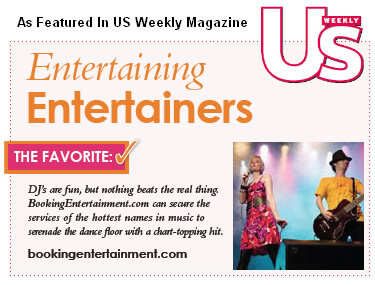 For almost twenty years, Booking Entertainment has been providing full service turnkey concerts for clients looking to book headline entertainment for their San Diego area events, providing everything necessary in one, no surprise price. To help make your San Diego area event a success, almost any musician, speaker, or celebrity is available. No matter your venue, all of the same pieces go in to live entertainment at your event. These pieces include not only an onsite team to produce the musical portion of the event, but also flights, ground transportation, hotel accommodations, backline equipment, staging, sound, lights, fees, per diems, and misc. rider requirements. The best way to start is with the Entertainment Request Form. Use it to provide us with more information about your upcoming event in the San Diego area. Within twenty-four hours, an agent will make contact to discuss the process and answer any additional questions. After narrowing down the best entertainment option, the agent will return with a turnkey price, one that includes all the elements described above. At this point, clients can confirm that they want to move forward and the agent will send the formal offer to the talent. Booking Entertainment is excited to take its almost twenty years experience in the business and use it to make your San Diego area event an unforgettable experience.